ITC’s ‘Kitchens of India’ series is a fascinating endeavour to shine a light on unique, undiscovered, royal, and forgotten aspects of the Indian culinary scape. In the past, Kakatiya has featured regional cuisines from the mountains in the North – Kashmiri Pandit cuisine and Ladakhi. Now, Kakatiya is turning its attention to the great plains of the west. Chef Anvir Singh has flown down from ITC Rajputana in Jaipur to showcase the rugged cuisine from the arid stretches of Rajasthan. The enterprising Marwari community from Marwar has made a mark in all parts of the country. The Marwaris are vegetarian; best-known dishes from this community include Ker Sangri, Gavarfali, and Gatte ka Sabzi. Two dishes from the vegetarian spread in the ITC buffet stood out owing to their distinctive ingredients and the interesting flavour. Dhandushi – a thick gravy prepared with Moong Mangodi and chopped up pieces of parantha. And Khatta meetha Tamatar – a thin, sweet and sour tomato gravy. If you’re familiar with Gujarati cuisine, some dishes like Aloo ka Rassa wala Shaak will feel familiar. Others like the Gobhi Hara Masala and Haldi Mirch ka Paneer will feel at home anywhere in Northern India. If there’s one dish that all the disparate regions of Rajasthan love with equal fervour, it’s Dal Baati Churma. Baati is believed to be as old as the kingdom of Mewar. The story goes that soldiers of would break up the dough into small balls and bury it in the sand in the morning. Through the day, the balls would get baked by the Sun. They would be broken and consumed with ghee. The other accompaniments got added on later. The Dal Baati Churma whipped up by Chef Anvir is a tad more fashionable and sophisticated than the rustic, sand and sun-baked one. But it scores full marks in the taste department. Over the years, many other add-ons have been incorporated into this ensemble. At Kakatiya, you’ve the option of adding a bit of Lehsun Chutney and Jaggery into the mix. The Dal Baati is undoubtedly one of the main draws of the festival and will be a regular feature in the buffet. Be careful though, three or four baatis, and you might have to call it a night. While Marwari cuisine is vegetarian, the Rajputs of Mewar loved to not only eat non-veg but they often embarked on lengthy hunting expeditions. Junglee Murgh is a delicacy typically prepared on such expeditions with gamey wild fowl. The ingredient list for this recipe is surprisingly short – ghee, chillies, and salt. The beauty of this preparation lies in its simplicity. Chef Singh used Mathania chillies from Rajasthan that are mild but flavourful. The thin gravy worked wonderfully with rice as well as the course bajra rotis. Fish isn’t an ingredient that most people associate with Rajasthan, but thanks to the Chambal River flowing through the eastern portion of the state, it’s a common ingredient in some communities. The Sarson Machhi at Sheraton Hyderabad’s Marwari Food Festival by Chef Kedia had reminded me of Punjabi flavours. The Rai Tamatar ki Machhi at ITC, however, is quite distinctive. Once again, the sweet and sour flavour of tomato is used quite brilliantly. The showstopper in the non-vegetarian section is, quite predictably, the Lal Maas. The recipe for this dish varies significantly across the state. Chef Anvir Singh’s recipe is a liquidy gravy with a striking red colour derived from Mathania chillies. It’s quite evident that plenty of ghee went into this Lal Maas. It’s both fragrant and fiery. I was told that the heat level has been toned down slightly; the Lal Maas in many parts of Rajasthan is fiery enough to trouble even seasoned hotheads. I didn’t have any trouble negotiating the chillies in any of the preparations. However, if you’ve a low tolerance for heat, either use the Masala Chaas to soothe your palate or head to the desserts section, which features quintessential Rajasthani sweets like Malai Ghevar, Lapsi, and Doodh Jalebi. 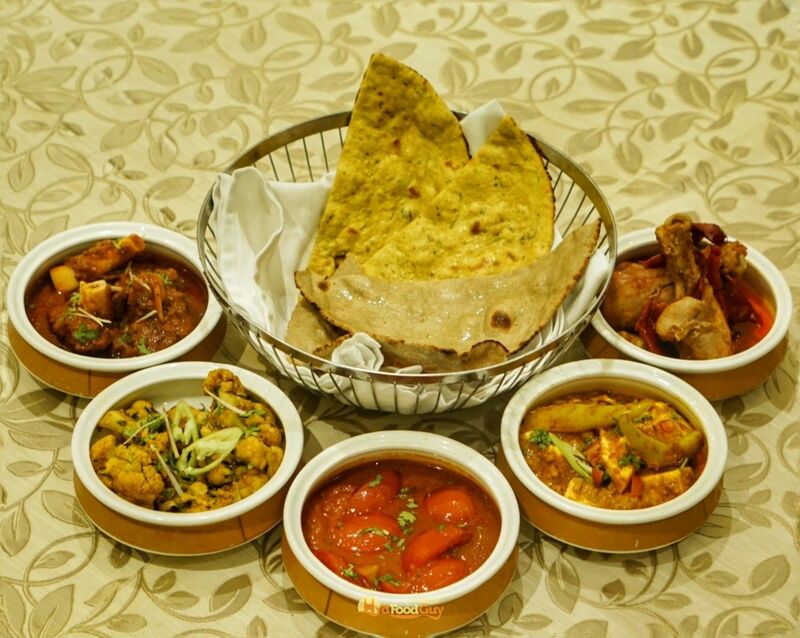 The colourful and celebratory Rajasthani spread will be available 7:00 onwards at Deccan Pavilion till Mar 24.